This is written not as a scientific description of the gene but rather as a guide for parents in understanding the particular mutation that their child may have. It can be frustrating and overwhelming to decipher information on genes and chromosomes when you do not have much knowledge of them in the first place. For that reason, this is written in an effort to explain chromosomes and specifically this gene we call FOXG1. First of all, a “typical” person has 23 chromosome pairs. One chromosome from each pair comes from your mother and the other from your father. Each of the chromosomes contains genes that are like the instruction manual for creating proteins. These proteins control things as simple as eye color to things a bit more complex, like brain development. The “short” arm of your chromosome is referred to as the ‘p’ region while the “long” arm is considered the ‘q’ region. This is why on the genetics report that you received, it may say the mutation is in the 14q12 region. That is just the specific location of the mutation. It just so happens that FOXG1 is one of the genes that lies within the 14q12 region. Your genetics report might also say your child has a 3Mb (or some other number) deletion or duplication or truncation of the 14q12 region or a point mutation. This number refers to the number of nucleotides (a basic unit of DNA) that were affected. Without going into much detail here- the bigger the number, the more nucleotides that were affected. What that means is that even though your doctor might have only mentioned FOXG1 being mutated, other genes were as well.They tend to believe that FOXG1 is the most important gene in that region, however, so it is the one that is mentioned and ultimately the one you will focus on. Remember when I said that some genes control eye color and some “more important” genes control things like brain development? Well, FOXG1 is one of those “more important” genes. Because of this, the gene has to be in just the right amount in order to function correctly. There are many different types of genetic mutations that are possible. 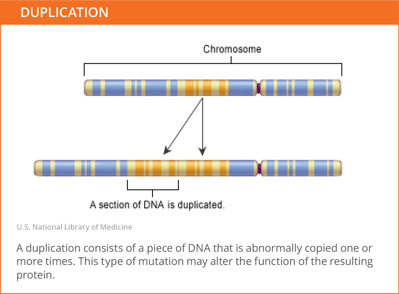 To go into detail on each type would be confusing and would require way more of an in depth study of genetics, so for the purpose of this explanation, we will only look at deletions, duplications, frameshift and missense mutations. A deletion of FOXG1 means exactly what it sounds like. For some reason, during the very early development of your sweet little one, FOXG1 (and possibly some of the genes around it) was deleted. This means that all of those important jobs of FOXG1 are going to go undone in your child. The truth of the matter is, no one really knows what all of the jobs of FOXG1 actually are, but we do know that it aides in developing your child’s brain correctly. In most cases of a FOXG1 deletion, the brain still forms but something called partial or complete agenesis of the corpus collosum occurs. This means that the portion of the brain that connects the two hemispheres is either not present at all (complete agenesis) or is only partially formed (partial agenesis). This can lead to cognitive disabilities, delays in milestones, low muscle tone, vision impairments, low perception of pain, and more. A true duplication of FOXG1 is rather simple. It simply means that the region on Chromosome 14 containing FOXG1 was doubled. There are numerous scientific articles that have been published regarding duplications of the FOXG1 region; however, symptoms vary among the children discussed. While one article depicts duplications as having very drastic symptoms, such as mental retardation, seizures, and severe speech impairment or absence, another article describes three different individuals that have been determined to have a duplication of FOXG1 and are neurologically normal. As for personal experience, one child in this group is known to have a duplication of FOXG1, and this child’s only symptom was seizures, particularly Infantile Spasms. They were treated and stopped and the child is otherwise typical aside from being a few months delayed in speech. They are a bit more complicated than true deletions and duplications because they require a bit more knowledge of genetics. Very simply, your genes are made of DNA which is made up of four different bases (A, C, T, and G). The DNA is “read” in groups of three bases, called a codon, in order to produce the proteins that inevitably make you who you are. There is also an important codon referred to as the STOP codon. This group of three tells the reading frame to stop reading — essentially the protein is finished and ready to go do its work in the body. Very simply, your genes are like the instruction manual for making you but the proteins produced by the instruction manual actually do the work. Now, a frameshift mutation arises when the reading frame is “shifted” and the instructions are therefore read incorrectly. This can result in either a non-functioning protein being created and/or a shorter protein being created. 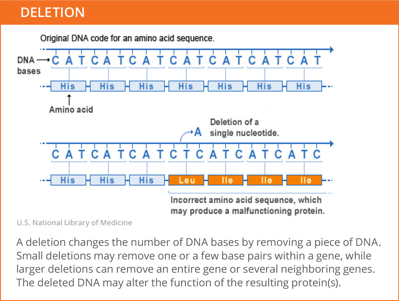 For example, if an extra base were inserted (or a base was duplicated or deleted) into the reading frame, a non-functioning protein may be produced. 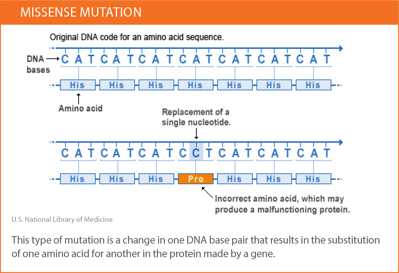 It is also possible for an entire STOP codon to be inserted mistakenly so the protein that should be created is not. This is referred to as a truncation mutation. Here is a VERY basic example of a reading frame using some words you recognize. First, I will show it to you as it should be and then with a base being duplicated. See how the duplication of that one base (or letter A) threw off the rest of the reading frame? 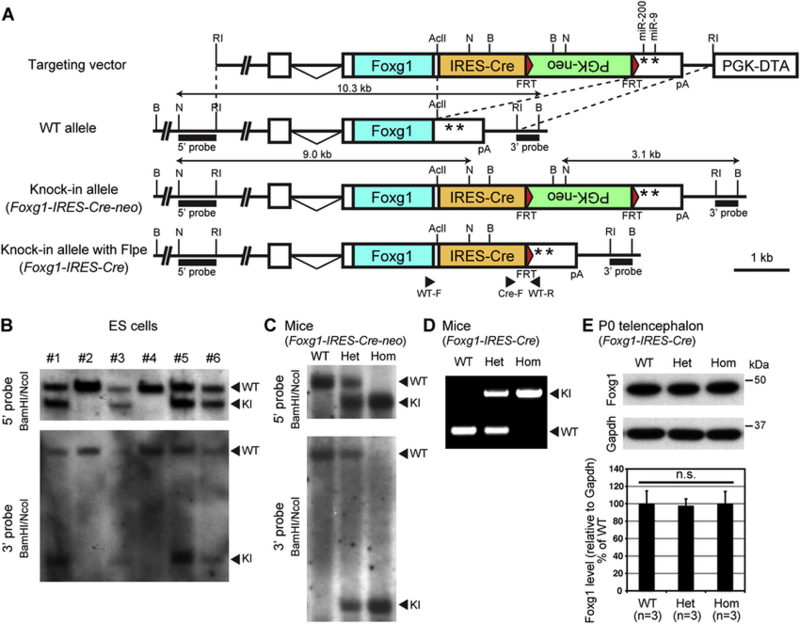 Specifically in the case of FoxG1 frameshift mutations, the protein that was supposed to be created for perfect brain development was not because either another base was inserted or deleted or a STOP codon was inserted prematurely. 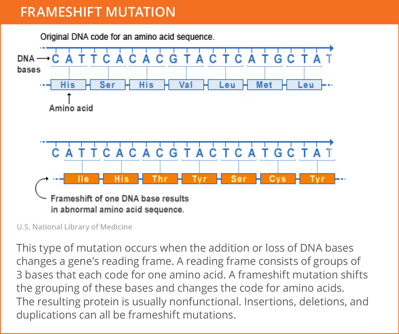 This is why symptoms of a frameshift mutation often resemble those of a deletion. Basically, even though the gene is there, it wasn’t read correctly so it doesn’t function properly. due to a single base change (in bold). 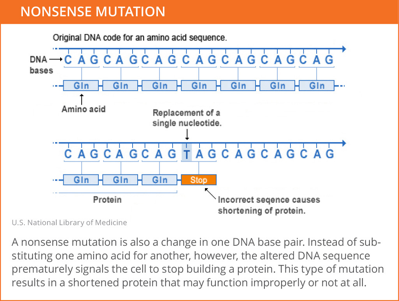 When this codon happens to play an important role for the protein, the mutant protein resulting from the missense mutation will not be functional. The resulting nonfunctional protein presents symptoms in a FoxG1 child similar to those that have a deletion or frameshift mutation. Should I Have More Children? In most cases, the mutation in FOXG1 that your child has is the result of what is called a de novo mutation. This means that neither parent has the mutation and thus did not “pass it on.” If this is the case, your future children will probably (as in, it would be super duper extremely rare if it happened) have a normal FOXG1 gene. In some cases; however, the mutation in your child’s DNA came from one of the parent’s gametes—egg or sperm. These are known as gonadal cells, so when this is the cause of the mutation, it is called gonadal mosaicism. It is possible that either you or your spouse has the mutation of the FOXG1 gene in some of their gametes. The problem here is that it is impossible to test all of your eggs or sperm to see if the mutation is present in some of them. With that being said, it is possible to have multiple children all with the same genetic mutation, but it is also possible to have one child with the mutation and others that are completely typical. In summary, there are a multitude of mutations that can occur during development of an embryo. In fact, all of us have genetic mutations, but most of them will never be discovered because they are in parts of your DNA that don’t code for “important” proteins like FOXG1 does. It is our hope that further research will enable us to understand the functions of this gene even more.